I have a special section on my blog dedicated to recipes straight out of the cookbook my mom made for our family before she passed away. I am going to try to make them easy and with ingredients that can be found at your local grocery store. Maybe one day I will try to alter the recipes to make them healthier, or using different ingredients, but for now it’s important for me to make them taste just how my mom made them (but in a gluten-free version). I want to have these available at my fingertips and I hope you find one or two or more that you like! 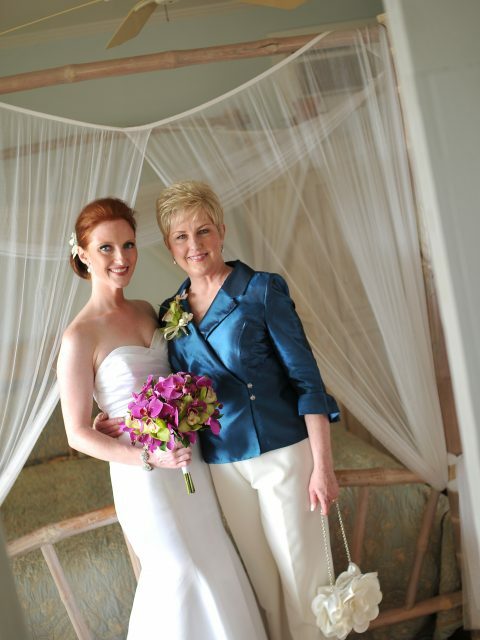 Me and my mom on my wedding day in 2011 in Maui, Hawaii. My mom loved Hawaii! My mom, Colleen, passed away from breast cancer in 2012. She was 64. She was first diagnosed in 1991 when I was only 11 and she had a mastectomy and did chemotherapy. There were probably only a handful of days where I even knew she was sick. Looking back now, I realize how fortunate I was that she lived through that and that we had all those extra years with her. She was cancer free for 16 years and then it metastasized to her bones. In the end it spread to her liver and that is ultimately was what was unbeatable. I am so fortunate I could be with her when she took her last breath. It is a very profound experience to be with someone when they die (especially the most important person in your life) and I feel lucky that I could share that moment of her life with her. I was devastated when she died. I knew it was coming, but I was not prepared for what it feels like to never ever speak to or see or touch her again. Shortly before she passed away I told her that I was so sad because no one would ever love me the way that she loves me. She told me that it was true, that there was no love like a mother’s love (ok, now I’m crying). It still feels like it’s not real, even almost 6 years later. Especially because she never met my children. I try to talk about her every day and my kids have something that reminds me of her in their bedrooms. I always say that she was my soul mate. I have a special connection to my husband and a love for my children that is unexplainable, but I do feel like my mom and my souls were connected and there is just a piece of me missing now. My mom was the best. She was kind and loving and she was always striving to make others happy. She always had her nails painted and looked impeccable. She never complained, even on her sickest days. I can still remember what her cheek felt like against mine when she hugged me. I can still hear her laugh and I can still imagine what she smelled like. I miss my daily phone calls with her and I miss the advice she gave when I was having a bad day. Side note: That felt really good to share. When I think of my mom, I picture her working in her kitchen. My mom always had baked goods on the counter. She had an old Rubbermaid cookie jar with an orange suction lid that was usually filled with cookies. I wonder if that’s still at my dad’s house?? So in 2009, she spent months putting together a cookbook of all the recipes that she made for weeknight dinners, special desserts for baby showers or parties, side dishes for family get togethers and, of course, all of her Christmas cookies. She dedicated the cookbook to my sisters and I and she signed them with a special note. That cookbook is really special to me and I am so happy she took the time to make it for us. 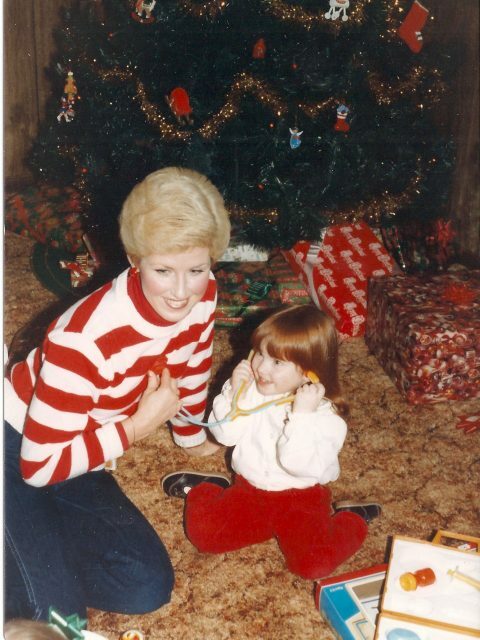 Christmas 1983. I would give anything to hear her heartbeat again. My cookbook has gotten a lot of use. The pages are wrinkled and filled with food stains and post-it notes of things I’ve learned from making the recipes and then converting them to be gluten-free. My goal is to go through each and every recipe and make then into versions that my family and I can eat. I don’t claim for them to be original or unique. They are just very simple, “Minnesotan” dishes but they remind me of growing-up. I think my mom would be proud of me for embracing my Celiac Disease and for how I’m working through this obstacle. I wish she could be here now and I hope that at least I can keep her memory alive by talking about her often and sharing her recipes!